Keeping greenhouse gases sequestered in the tangled roots and soggy detritus of mangrove forests could be vital to keeping the planet cool enough for habitation, scientists say. 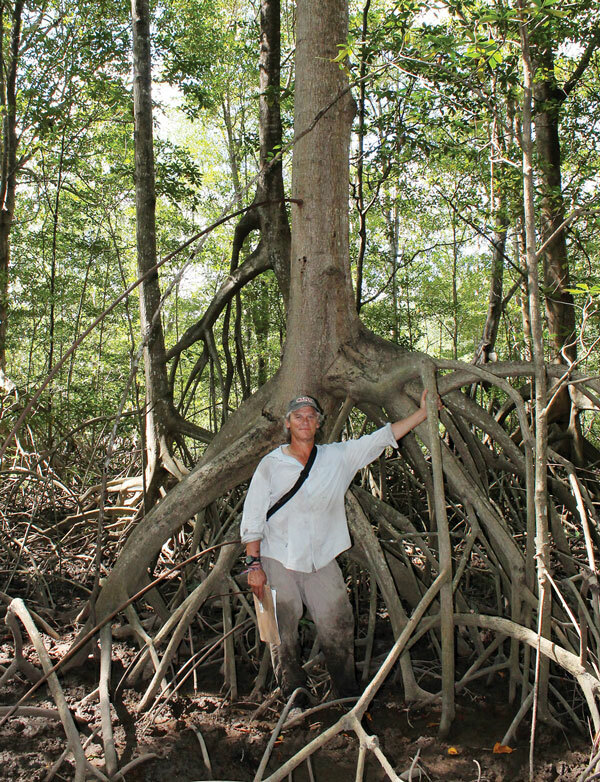 J. Boone Kauffman studies the carbon storage capacity of mangroves around the globe. AS THE UNITED NATIONS GEARS UP for its global climate change conference in Paris in November, the “blue carbon” message is gaining ever-more traction in the debate. Keeping greenhouse gases sequestered in the tangled roots and soggy detritus of mangrove forests could be vital to keeping the planet cool enough for habitation, scientists say. Arguing that mangroves, especially those in the vast archipelago of Indonesia, are the world’s richest supersinks for carbon dioxide, Kauffman and an international team of researchers make a case for preserving these vital ecosystems. “Preventing mangrove loss would be an effective climate change adaptation strategy,” the researchers say. “Conservation of carbon-rich mangroves … should be a high-priority component of strategies to mitigate climate change.